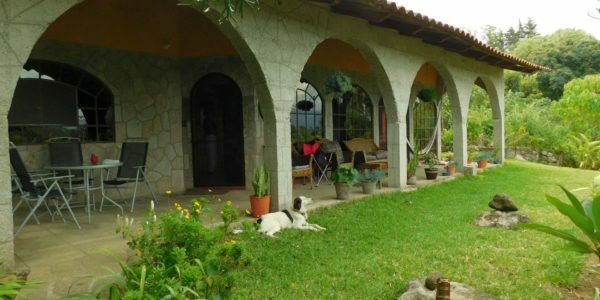 A beautiful, luxurious 1-bedroom home for rent in Panajachel, Lake Atitlan, offering comfort, light, space and a spectacular oasis garden space! 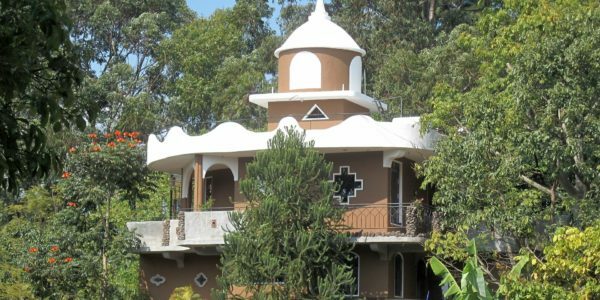 Situated in the popular residential area of Las Manos in Jucanya, due to its peace and security. Casa Carolina is a beautifully-decorated home with a fully-equipped kitchen providing modern elegance, comfort and security for your stay. 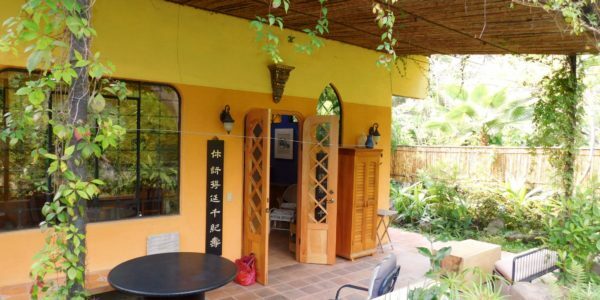 Lush tropical gardens with paths, patios, the sound of running water and traditional Mayan sauna (Tamascal) make it a paradise of beauty – your own private sanctuary just a short walk from town and with on-site parking. House manager Carmelina will greet you with the keys and show you the house and property. Fresh flowers along with coffee/tea, and bottled water await your arrival. 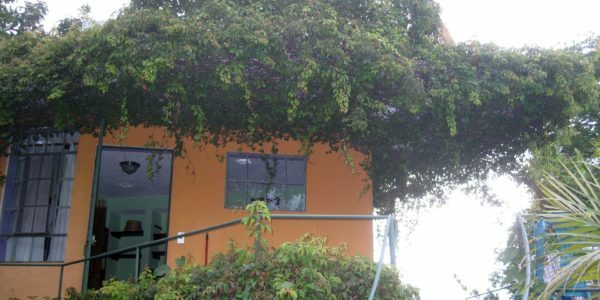 The house has a large, lush garden carefully tended by the live-in guardian/gardener, Juan. A meandering path leads up to the main entrance of the house all laid on on one level, except for a few steps leading down from the living area into the fully-equipped kitchen. A large, light, spacious living space greets guests as they enter, with a fireplace and dining area to one side. Off this beautifully decorated area is the double bedroom and bathroom with bath tub. A few steps take you down into the spacious kitchen. This leads out to a small outside dining area on a patio. At the entrance to the house is a seated area, as well as another seated area in the garden. Almost hidden in the verdant garden is a traditional Mayan Tamascal (sauna). The manager is only a phone call away for any questions you might have. The guardian can help you with drinking water, changing gas tanks etc. 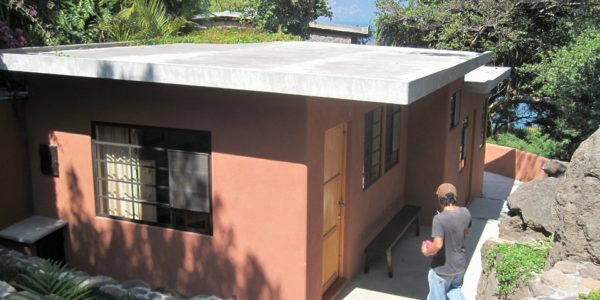 The house is a just short, cheap tuk tuk taxi ride into Panajachel, Pana, where you can find everything you need: banks, shops, market, restaurants, and docks with public boats to all villages around the lake. For further information or to view the property, please contact us. From $700/month – Min. 1 month – Max. 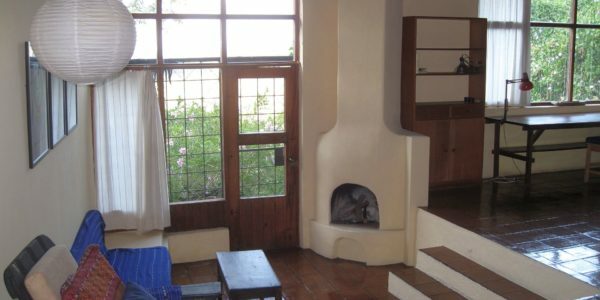 6 people Looking for a fabulous un-plugged, Get Away monthly vacation rental ..